LG has a respectable and established camera division, oftentimes competing in image quality as well as value-added features with other mainstream flagships. Oppo is a relative newcomer to the scene, but nevertheless relies on its own applications in place of the standard Android media players and galleries. The Gallery on the Oppo Find 7 is a custom job, but surprisingly one with less features than the vanilla app. Obviously, Oppo has approached this interface with a less-is-more tactic. The default view is a grid of folders, with a name and number of images for each folder labeled underneath. You can't filter images by location, time, people or tags like you would in the stock app. You can select multiple images (folders too) and then Share and Delete options become available. The LG gallery is also somewhat pedestrian and doesn't have any sorting options. Editing is done through Google's Photos app. Both Music players are again very similar. They feature Now playing screens with prominent album art and playback options on the lockscreen and in the notification area. Both have great equalizer settings, with the G3 also letting you adjust pitch and playback speed and the Find 7 coming with the Wave MaxxAudio enhancement. The Oppo Find 7 comes with a pretty simple-looking video player, which supports DivX, AVI, MKV, MP4, etc. We had no issues playing files all the way up to 1080p resolution and the only real setback were certain files with XviD video or AC3 sound. The interface for video selection is pretty basic too - a list of all available files. The player supports subtitles too, but there's only an on/off toggle here, you can't manually pick the subtitle file (so it would have to have the same name as the video file to work, and be in the same directory). Also, some foreign language subtitles didn't display all characters correctly. The video player on the G3 is also very simple, but is still very powerful. It doesn't have as many features as those found on the likes of the Samsung Galaxy S5, but it does make up for it with the ability to play all sorts of file types and video/audio codecs - virtually everything we threw at it. The LG G3 supports QSlide, which puts the video in a small, resizable window if you want to use another app while watching video. You can even adjust the window transparency. Winner: LG G3. Although both devices have the upper hand over other flagships by being able to play 1440p videos at native resolution, the G3 has the upper hand with its more robust codec support and more refined video player interface. The LG G3 results in the first part of our audio quality test are nothing short of amazing. The smartphone produced the best numbers we've ever seen including a perfect -100 on the stereo crosstalk score. Sadly, the volume levels weren't quite up with the best so we can't unequivocally crown the G3, but it will be for those that value cleanliness above loudness. 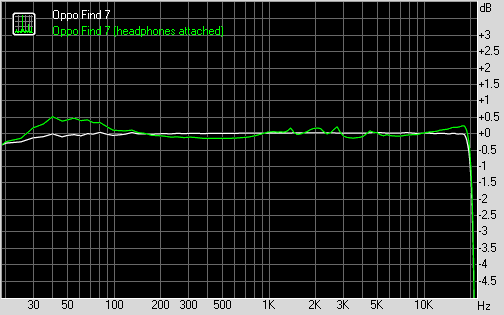 Plugging in a pair of headphones tells a similar story - the output is almost perfectly clean (the stereo crosstalk reading while excellent on its own, is no longer the best we've seen), while the volume levels are slightly below average. The Find 7 put in a stellar performance in in its own right, particularly the first part of our audio quality test. It had excellently high volume levels to go with its very clean output. Barring only the slightly high IMD reading, this is also one of the best score sets we've seen lately. However, the smartphone faltered quite a bit when we plugged in a pair of headphones. 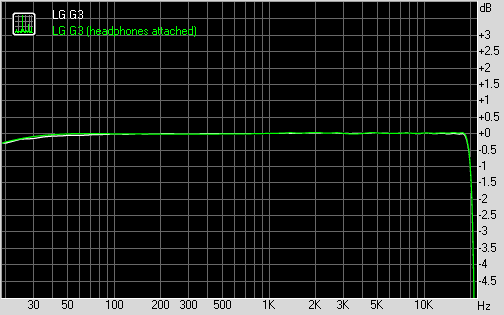 Its frequency response started missing the mark now and then, the IMD rose further and the stereo crosstalk hiked quite a bit. It's not as bad as the stereo crosstalk disaster that was the 7a, but elsewhere the more premium member of the pair lagged behind its stablemate. Volume level dropped as well, adding up to what was a good, but not quite flagship-worthy performance here. 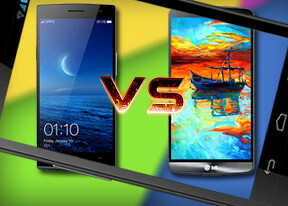 Winner: LG G3. While the majority of users will be perfectly happy with the output of either smartphone, when it comes to headphones-on performance the Korean device is clearly superior.